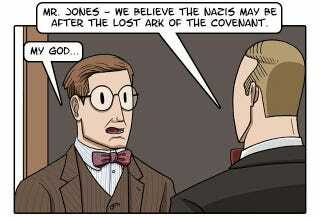 Granted, hindsight is 20/20, but if Indiana Jones had known what would happen when the Ark of the Covenant was opened, his actions in this comic would have made life much simpler. See, Indy, "It belongs in a museum" is thinking too small. Those mystical artifacts can actually be quite useful in the wrong hands.